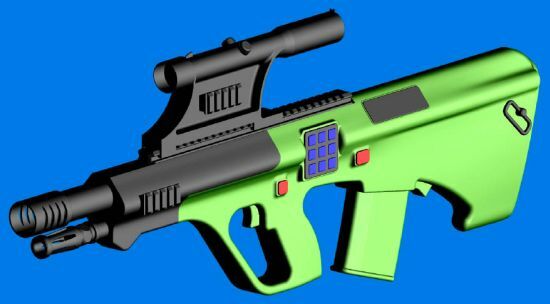 This is a CAD of the AICW (Advanced Individual Combat Weapon), designed by DSTO (Science and Technology Office of the Australian Ministry of Defence) and under joint development by two companies at the edge of military high technologies, this being METALSTORM, LTD. and TENIX DEFENCE SYSTEMS. The overbarrel grenade launcher will be 25mm, tube-fed, and the entire gun will be controlled by an FCS based on the BRASHEAR CONTRAVERS' one of the American OICW / XM29-SABRe. The grenades will have built-in microchips so that the FCS will be able to control their detonation time and point. Interesting enough, METALSTORM LTD. is developing alone another kind of similar weapon, called the HEM (Hybrid Electro-Mechanical combat system) which is an ADI F88 (Australian license-made Steyr AUG) with overbarrel, tube-fed semi-automatic grenade launcher, see the picture attached. The HEM is not going to have an expensive Fire Control System on it, simply a built-in microchip system to control the grenades detonation. Everything is made to reduce costs: the grenades will be standard 40mm shells modified with the implantation of a control chip.